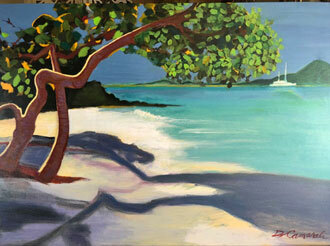 An Amazing View for Two / Villa Madeleine. 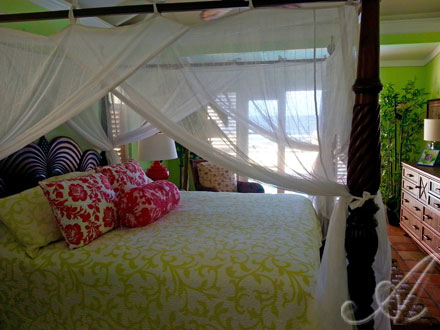 Absolutely perfect villa for a honeymoon or couple getaway! New completely redone pool deck! 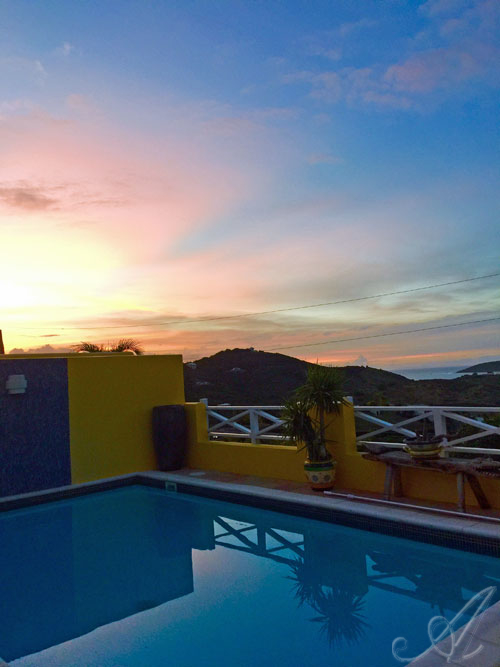 This choice Northshore facing top tier villa is a private one bedroom, one bath with private pool, fantastic water and golf course views and all the comforts of home while enjoying your time away with each other. It's clean, crisp and made for a couple. 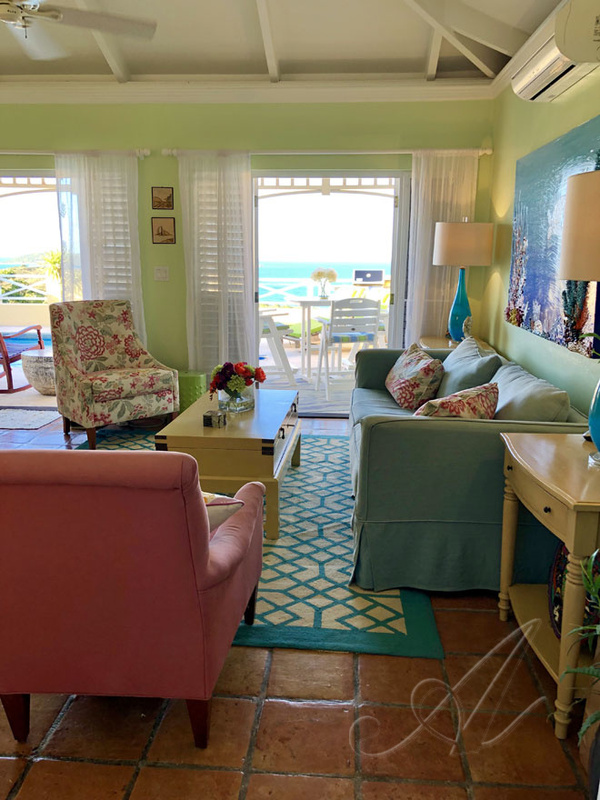 Completely updated and renovated with new painting, new furnishings and amenities both inside and out and of course the amazing view remains the same! 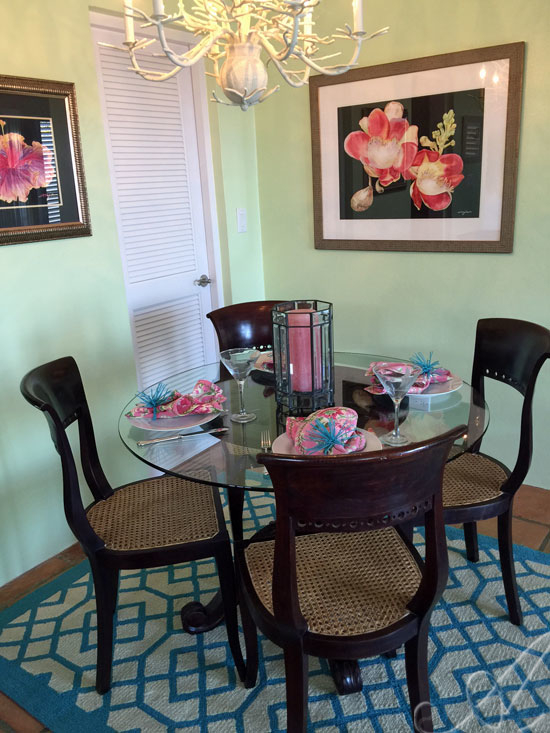 The great room is decorated with West Indian style funishings in soft caribbean colors with comfortable furniture and splashes of color and whimsy. As you enter, the french doors open to bring in the outside living environment. 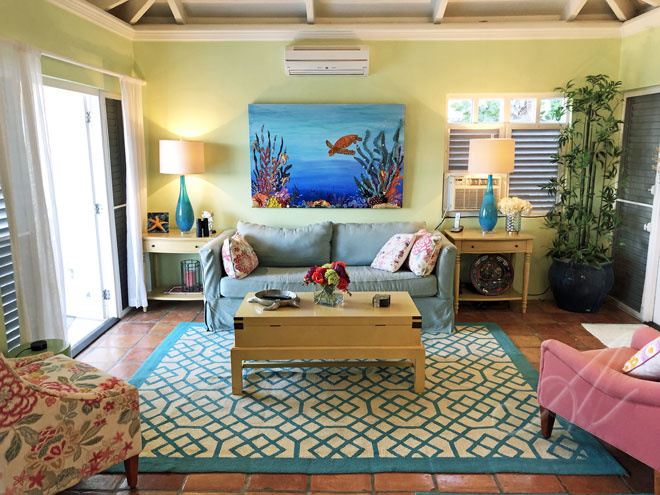 The great room is decorated with West Indian style funishings in soft caribbean colors with comfortable furniture and splashes of color and whimsy. As you enter, the french doors open to bring in the outside living environment. 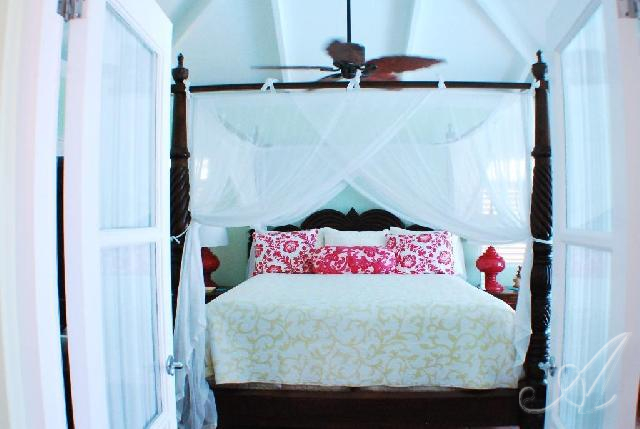 The great room has a ceiling fan plus a split system air conditioning unit and the villa is equipped with wi-fi internet as well. 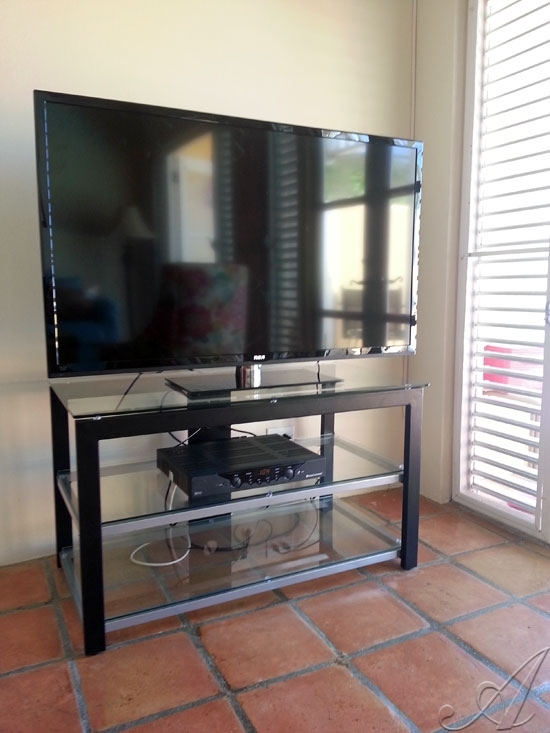 The entertainment center features a 55" flat screen cable TV, and the latest Bose sound system which has bluetooth capability, ipod/mp3 player, cd player and radio to enjoy while lounging outdoors. Have an Apple ID/Itunes account? If so, you can use the Apple TV amenity to stream the latest movies, your favorite TV shows and games. You can also access Netflix, Hulu, Amazon... all in high definition! There's even an indoor table arrangement for the occasional times you wish to dine inside. 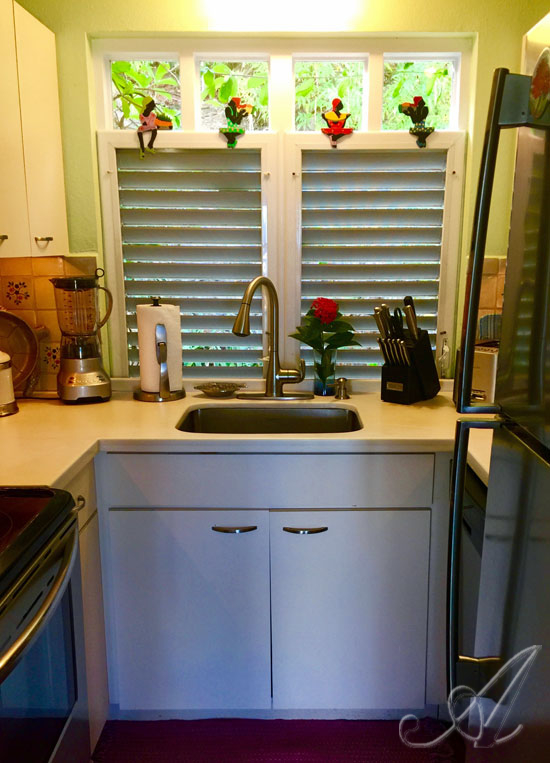 Off the great room is the charming decorated kitchen complete with all amenities and perks such as a Williams-Sonoma grill set complete with steak knives and more. And yes, a programmable blender to make those frosty drinks to enjoy poolside! The master bedroom suite features a king bed, ceiling fan, air conditioning and TV in the bedroom along with a comfortable lounge chair and the signature french doors that open to the pool deck. 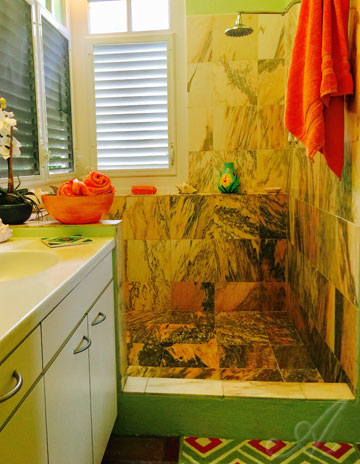 ...which leads to the master bath featuring one of the signature amenities of Villa Madeleine with it's large walk in marble shower. 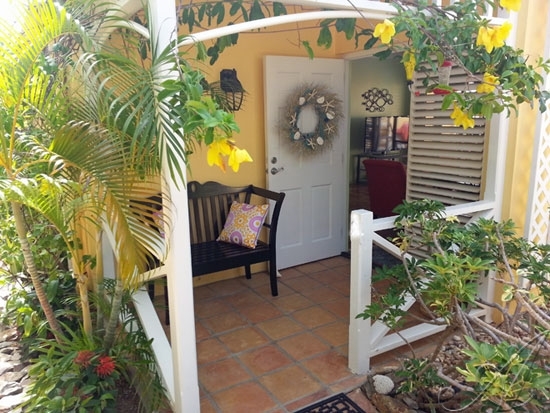 Caribbean living is all about outdoors and A View for Two fits right in with sun, soft breezes plus shaded cover when you want it and there's always the view! 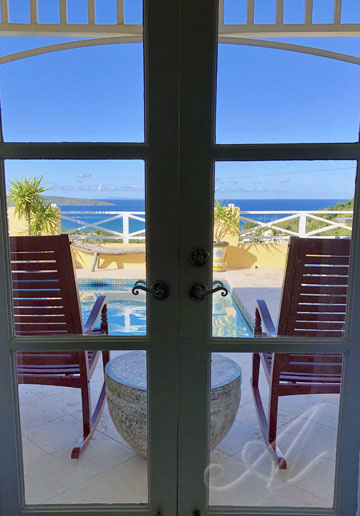 A comfortable private pool deck, lounge chairs, table/chairs for outdoor dining plus a gas BBQ grill to enjoy dining as you watch the stars come out. Enjoy the night time ambiance with the newly added cool remote controlled LED lights! 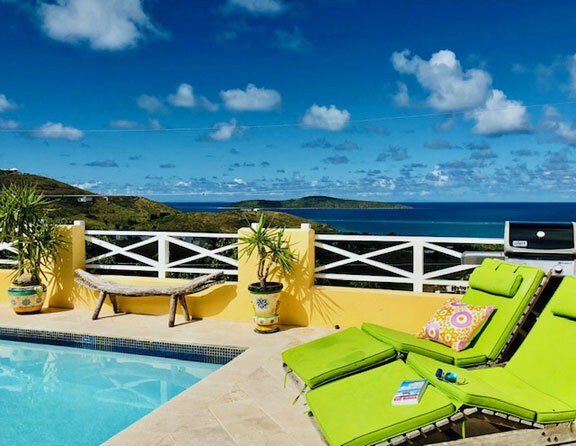 The villa is attentively-furnished with pool floats and noodles,portable beach chairs, portable cooler with ice packs for day trips to the never ending beaches. 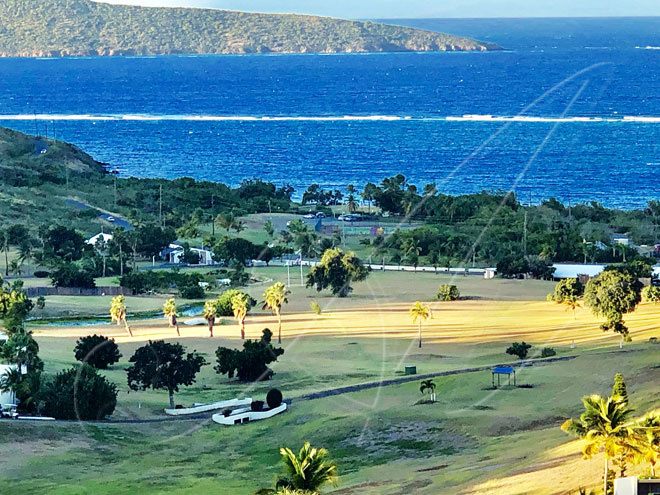 This villa features one of the best views of the ever changing hues of water with Buck Island in the distance plus the 9 hole golf course below. 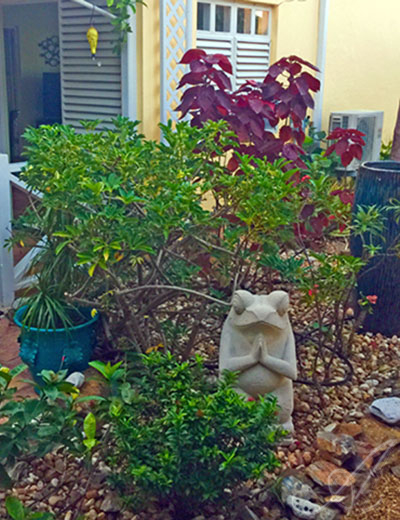 Surrounded by lush tropical landscaping the grounds are private and serene for each unit. 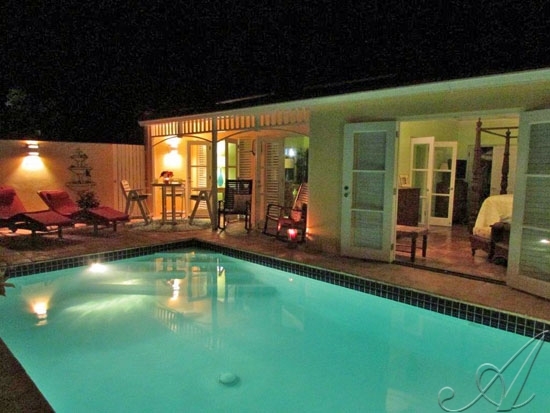 Each villa is in a patio home style with your own private patio and private pool located off of the living room area. 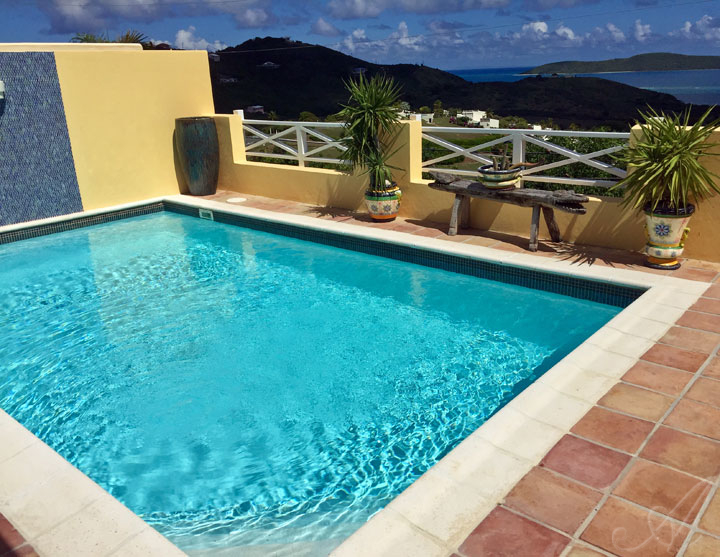 Cool tile floors, oversized marble showers, complete pool privacy in a walled garden sun terrace and excellent location to all island activities makes this a desirable choice. 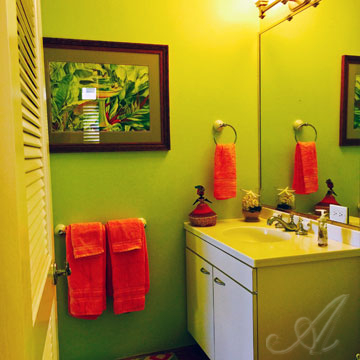 Fully equipped including washer/dryer, cable TV, wi-fi internet, pool floats, and more! Another great amenity! 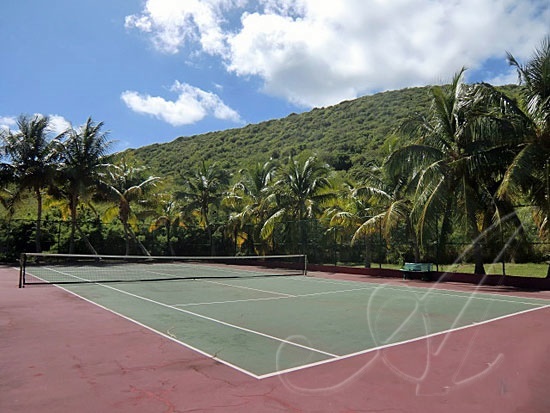 If you're tennis players bring your racquets - there's a newly refurbished tennis court on the lower southshore grounds to enjoy! 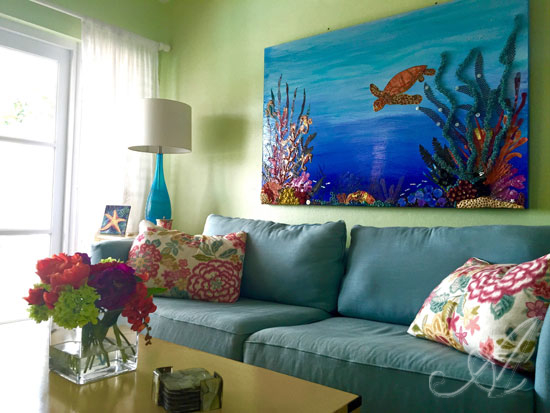 On a personal note, the owner of the villa is a talented artist where art is his passion and can be seen throughout the villa in decorating style and also in his paintings which may be purchased.